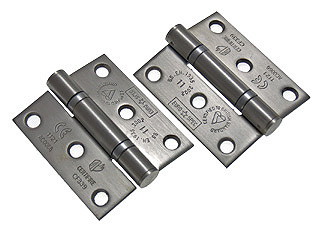 Ball bearing fire door hinges tested to BS EN 1935 and BS EN 1643 PART1:2000, CE & Certifire Approved, grade 11 for doors upto 80kg. Size 3inch(76mm x 67mm x 2.5mm). Available in Polished Stainless Steel, Satin Stainless Steel & PVD Stainless Brass finish - hinges priced in pairs, supplied with screws.